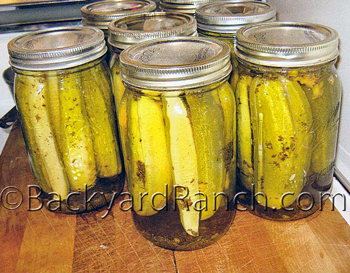 Home canning kosher dill pickles is fun and delicious way to use up all the cucumbers. 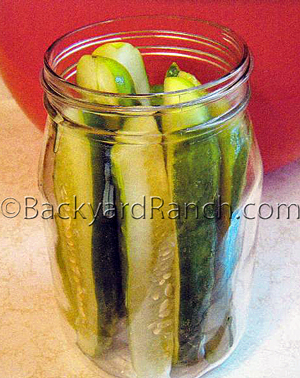 One of our favorite recipes for pickles that cannot be purchased in the store. These can be made in small batches. You will need young, firm cucumbers, a large bowl, stock pot, jars, flats, rings, a small bowl, a paring knife, table knife, a roll of paper towels, a large pot or canner, a rack to place inside the pot or canner and a timer. You will also need dill seed, celery seed, apple cider vinegar, coarse salt, garlic cloves, hot peppers (optional), and alum (optional). 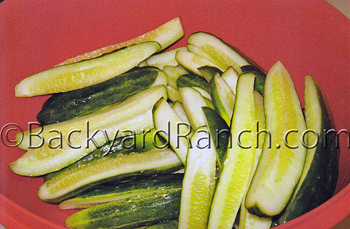 Before home canning kosher dill pickles, wash the cucumbers with cool water and slice. Soak overnight in cold water. Drain the cucumber slices. Pack the slices in each jar with: 2t dill seed, 2t celery seed, 1 clove garlic, 1 hot pepper, 1/8t alum (optional). Bring the pickling solution to a boil: 3/4c coarse salt, 1qt apple cider vinegar and 2qt water. Pour the solution over the slices in each jar while boiling hot. Take a hot jar, pour out the water (or pour it into another jar, if it is still hot), put the pickle slices into the empty hot jar. Fill the jar until you have about an inch of “head” space above the pickles. Then, pour in enough of the hot vinegar solution to cover the pickles. Allow for half an inch of head space above the solution and pickles. Wipe the mouth of the jar with a wet clean paper towel. Use the tongs to remove a flat from the hot water in the small bowl. Place a hot flat on the top of the jar and then screw the ring on the top of the flat and jar until the ring is hand tight. Repeat until you have used all your sliced pickles. Process in a hot water bath. 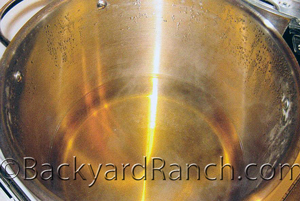 Place the rack in the pot or canner, the rack should be about half an inch off the bottom of the pot or canner. Fill with enough boiling water so that the water level will be an inch over the top of the lid on the filled jars. The water should be near boiling when the jars of pickles go in the pot. Only prepare as many jars as will fit into your pot or canner at a time. The jars need to stay hot when canning pickles. Process for about 15 minutes for pints and quarts. At 15 minutes, remove the jars with the jar tongs and place them on a dry, heat resistant surface. Make sure not to place them on a surface that is covered in water, this will cause the jars to crack and shatter.